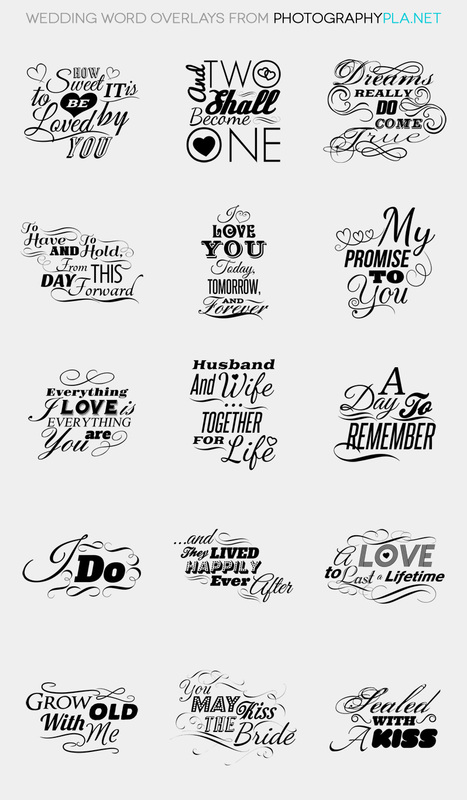 This set of word overlays is an excellent resource to add a little something extra to your wedding and engagement photos. The set includes 15 different quotes. Each one comes in .png format (black text on transparent background and white text on transparent background, 12 inches by 12 inches at 300 dpi) so they can easily be used in any image editor. Each one also comes in 2 different .psd versions: a layer .psd with text and shapes layers, and a layered .psd with all layers (text and shape) formatted as vector shapes. The .psd file with all layers as vector shapes will allow you to style each word individually, different colors for each word for example, and you can also use the file without downloading all of the fonts used since the text is a shape layer. The layered .psd that includes the text layers allows you to edit the text if needed, but you will need to have the specific fonts installed. A list of fonts used with links for free downloads is provided. Documentation for using the files is also included in the download. They are compatible with Photoshop and Photoshop Elements.